A deadly stretch of Sixth Street received the city’s first painted sidewalk extensions last week, created using low-cost, temporary materials to help make pedestrians more visible. The SFMTA implemented the pilot project between Market and Harrison Streets — four blocks dense with residential hotels and shops — to help curb injuries while the agency develops plans for a road diet. The six sidewalk bulb-outs replace car parking spaces, marked using a red and white gravel surface and plastic posts, with boulders and portable concrete planters set inside. The measures are expected to make pedestrians more visible to drivers as they enter crosswalks, and send the signal that the street isn’t just an extension of the freeway, but a gateway to a dense neighborhood street that drivers are expected to share with residents. Sixth is designed primarily to speed drivers between the Tenderloin and the 280 highway through the dense SoMa neighborhood. Between 2005 and 2010, 93 pedestrians were injured and five were killed by drivers on this stretch, according to data from the Department of Public Health. “If we don’t make our streets safer, if we don’t have proper enforcement, if we aren’t designing our streets to be shared by multiple users, people actually die or lose important parts of their body,” said Kim, who noted that in District 6 alone, pedestrian injuries have racked up a cost of $13.5 million in the last five years in costs for medical treatment and emergency services. Although many pedestrian injuries occur while drivers are making a turn, neighborhood residents also say pedestrians are often hit on multi-lane streets like Sixth when, as they make their way through a crosswalk, some drivers stop to yield the right-of-way, but others attempt to pass, apparently not expecting a person to be in their path. Half of the $61,000 set aside for the pilot project came from a chunk of Supervisor Kim’s $100,000 pot of discretionary funds (every supervisor received that amount in recent budget negotiations). The other half came from Mayor Ed Lee’s office. 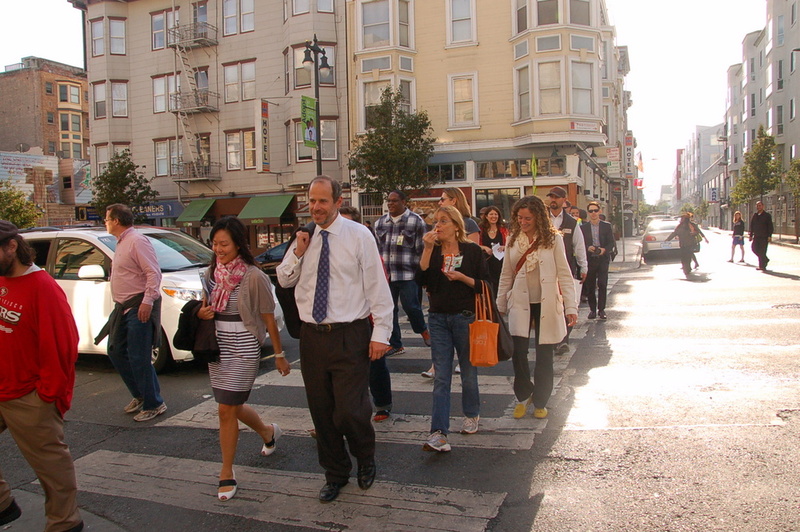 Longer term, the SFMTA is studying the prospect of slimming Sixth down from four lanes to two, which should dramatically calm car traffic and curtail the ability for drivers pass one another when a pedestrian is crossing the street. The agency is also considering adding new traffic signals at mid-block crosswalks to give pedestrians a dedicated phase to cross, as well as digital displays to show drivers when they are exceeding the speed limit. 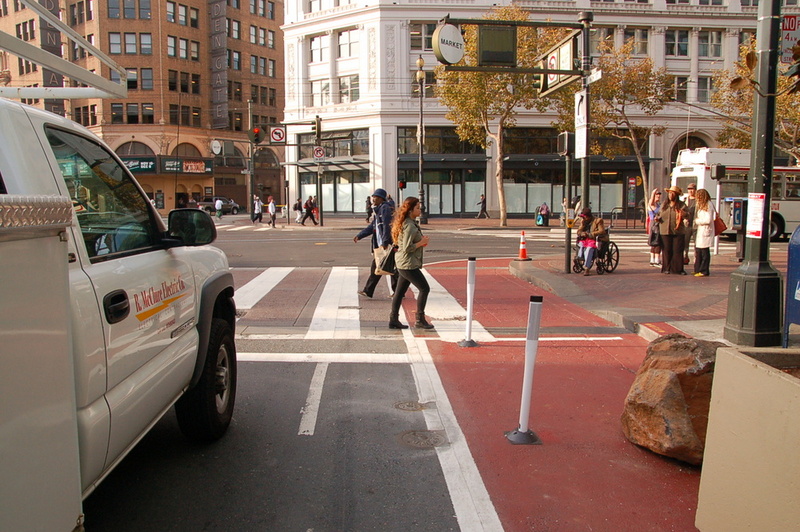 The SFMTA has added some other minor improvements in recent years, including street trees, concrete bulb-outs, and more visible “continental” crosswalks. The agency also lifted a ban on curbside car parking during rush hours in the eastmost lane of Sixth between Folsom and Market Streets, since parked cars provide a physical barrier between pedestrians and fast-moving vehicle traffic. It’s unknown when the long-term measures could be implemented, but the SFMTA plans to hold a community meeting to discuss them on November 21 (the exact time and location have yet to be determined). Until now, San Francisco has only used temporary materials to expand pedestrian space as part of the city’s Pavement to Parks plazas. Sixth Street is the first to have curbs extended using that method. New York City, meanwhile, has been reclaiming street space for people with quick and cheap measures for several years under Mayor Michael Bloomberg’s administration. The city has seen dozens of public space expansions, including the famous Times Square street reclamation, where plans for a permanent plaza are underway. “It’s been amazing to see the difference they’ve been making for the quality of life of pedestrians and cyclists,” said Kim, who grew up in Manhattan. A road diet and other major safety measures on Sixth appear to have broad support from both residents and merchants, even if space for cars is reduced, according to at least one tenant organizer. City officials and community advocates use a mid-block crosswalk on Sixth. During a press walking tour last week, a group of city officials and community members made their way across one of the mid-block crosswalks on Sixth. Drivers promptly yielded, and all made it across safely, but SFMTA Director Ed Reiskin noted that it’s hardly comparable to the experience residents regularly contend with when crossing on their own. Hooray for progress! Sixth needs to be done just like 2nd street will be – raised cycletracks all the way down. And how many of the injuries were the crack head junkies who run into the road illegally? SF is all about over-reaction, and if you go down that stretch of road you’ll see very little pedestrian respect for any sort of traffic. I’ve nearly hit two but thankfully have been able to stop my bike in time – cars can’t stop so quickly. Now you add another bottleneck, requiring other changes or shifting the traffic elsewhere. Cars can stop quickly if the drivers aren’t treating the road they are on like a freeway. SLOW DOWN. Don’t be so selfish. They look great and we need more of them fast, especially in SoMa until we can afford the time and money for more permanent solutions. 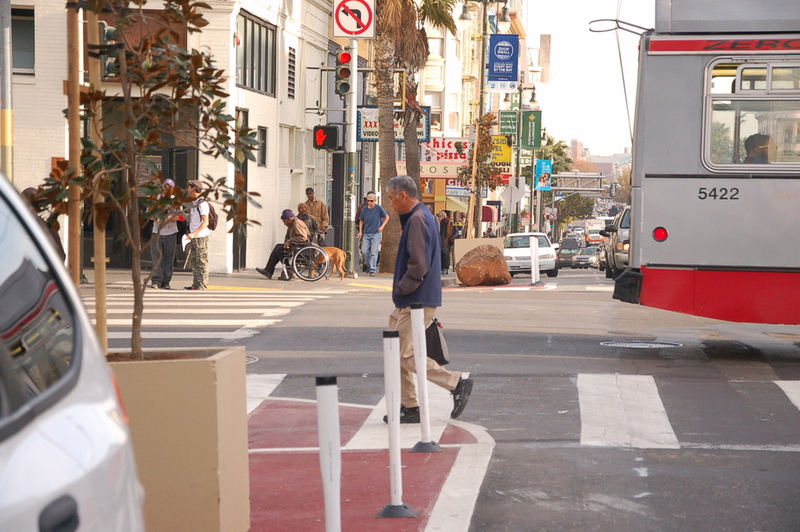 6th street is much more pleasant to walk down these days than in years past, and a lot of it has to do with the treatments SFMTA has been doing to make walking safer. A dense area with almost 0% car ownership should not have to experience highway traffic volumes. As the article noted, pedestrian injuries in district 6 have cost 13.5 million in the last 5 years. So regardless of your disrespect for human life, there are real consequences to the city for ignoring how dangerous many of our streets are. It’s about time SF has used this sort of treatment for inexpensive, effective street upgrades. How about doing the same on 2nd Street instead of waiting until 2016. It is much needed and cannot wait. Saw these the other day; liked them. But a more complete solution would be to put random rocks in random lanes, where random pedestrians cross mid-block. If the statistics don’t reveal whether pedestrians were struck at crosswalks or crossing anywhere and anytime they pleased, they are not complete. (That being said, I love the people down here and SOMA traffic is fearsome). 6th street and SoMa in general need more mid-block crossing since the block distances are huge, there is a high pedestrian volume, and there are already mid-block alleys. The alleys may in fact be legal crossings that are interpreted by most people as illegal since the cross walk is unmarked, though I don’t know for sure. Unfortunately SFMTA is reluctant to add striped crossings without a signal because of motorists likelihood of violating pedestrian right of way and hitting people and the prohibitive cost of a new traffic signal (as well as messing with bridge/highway LOS). Actually, traffic signals are just expensive to build. When they are contracted out, the costs come out to over $400,000 each. LOS is not really a factor and does not add to the cost. Ok, but SFMTA is especially reluctant to mess with bridge/280 traffic LOS and SoMa LOS in general. Also see: planned Folsom bike green wave ending once it reaches SoMa from the Mission. True, true. As a longtime SF resident, I have noticed over time the city has added signals and stop signs on secondary streets such as Shotwell, in the Mission District, acknowledging these are big blocks where people work and live. My driving brain isn’t thrilled at the extra stops they entail, but my walking brain is grateful. I think we should do more to divert 280’s off-ramp drivers traveling north to other streets BEFORE they get close to 6th and Howard-to-Market. Maybe some dedicated left turn signals at Brannan, Harrison, and maybe Howard???? That would disperse highway drivers who have no burning desire to take 6th Street north to Market and beyond, but are kind of stuck on it due to the off-ramp. A lot of drivers would probably prefer taking one-way streets 7th and 9th north. With fewer northbound cars present, we could more easily reduce 6th Street to just one northbound travel lane between Howard and Market. That would help create the more pedestrianized environment we want there. The southbound lanes on 6th are less of a problem, because currently drivers can approach the 280 on-ramp from a variety of other streets (4th, 8th, 10th for example), cutting over to 6th in less heavily pedestrian areas a block or two before the on-ramp. better yet, tear down this freeway stub Mr. Lee! Tear down this freeway stub! I hope we DON’T start discussing the 280 freeway. If it gets partially torn down, so that its off-ramps disgorge cars a bit further south, we will still have to find ways to disperse the drivers using the off-ramp, so that the highway’s endpoint causes the least amount of neighborhood(s) disruption as possible. Sixth Street’s problems are immediate, and need immediate solutions that deal with existing infrastructure (like the still long to be in existence 280). Very good point. That’s why this is great, we need SoMa streets to be better now whether there is a freeway or not. I think the 280 should still come down, all the way to SM county, and it’s nice to hear that there is a burgeoning freeway-free-SF movement. For a signal? Not really… Maybe you’re talking about streetscape projects. For several mid-block signals as called for in the central corridor plan, yes. Absolutely. You can pretty much file a CEQA appeal for anything but a light signal is ground zero as the claimant can say that the light will slow down traffic. And plenty of people are out there willing to throw that up against the wall to see what sticks. Sure, anyone could file a CEQA appeal against anything. But has that ever happened for a signal? You sound very confident that the cost of a signal is directly related to LOS issues and/or CEQA appeals, but that really isn’t the case. Just trying to be accurate here. I’d never heard about this one, I just did a quick google search and pulled up the first dumb one I found. Painted Bulb-Outs Arrive at Howard Street — Are More Coming Soon?